Vuzix's AV920 eyewear gadgetry is billed as augmented reality. Michael Epstein loves technology almost as much as he loves travel. But the MIT graduate, who has lived in Morocco, Israel, Argentina, and Spain, knows that smartphones and PDAs - those stalwarts of our PowerPoint presentations and contact lists - can become fairly useless when we are exploring a strange new world. Some devices can't connect with all of the planet's wireless networks. Others can't take a picture worth uploading to Flickr. But for Epstein, a bigger problem is the lack of content. Our iPhones and BlackBerrys simply haven't got anything interesting to say about the places we go. That's why Epstein's Boston-based company, Untravel Media (www.untravelmedia.com/), makes podcasts with Arlington-based Spy Pond Productions: to bring a city's landmarks to life with rich, historical anecdotes. "We see site-based travel stories as a way to deepen the exchange [with new people and places]," said Epstein. Untravel this spring will release its most ambitious project yet. Called "Murder@Harvard Mobile" (www.parkmanmurder.com), it is an audio and video tour detailing the notorious 19th-century slaying of a wealthy Bostonian, George Parkman. Real-life relics, a skull here, a weapon there, will be placed in stores and other buildings on Beacon Hill, serving as waypoints for the tour. Call it the immersive travelscape: Globe trekkers wielding gadgets that augment what their senses are already telling them about their new environments. Whether you are passing by a sidewalk barbecue in Wuhan, or meeting a stranger on the stoop of a Hell's Kitchen brownstone, your phone will tell you more than you ever thought possible about that specific neighborhood, its people, and its cuisine. In the future, traveling with technology could also mean carrying cheap "single-use" devices that pinpoint your location on the globe, and pipe up with information about that particular spot. Cambridge Consultants, a technology company based in the United Kingdom, has developed two single-use concepts based on its CatchNet device platform. One of them, called Guiding Star, combines a small, pen-shaped gadget with a GPS receiver, connected wirelessly to an Internet travel guide. Think "Lonely Planet" on a stick. Another technology, augmented reality eyewear, which superimposes recorded images onto the real world, will also add layers of experience to town and country travels. Vuzix, the 3-D eyewear-maker, last month announced a pair of glasses, the Wrap 920AV, through which you can watch videos, while continuing to see what is going on beyond the projected image. 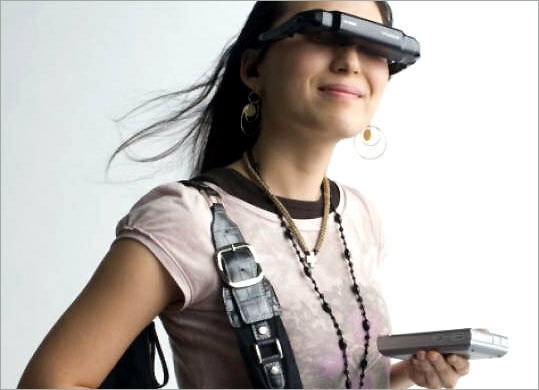 There is little content specifically designed for augmented reality eyewear. But in the future, someone wearing the Wrap 920AV will be able to visit a tobacconist's shop, for example, and see a convincing but virtual image of Sherlock Holmes's "black shag" on the shelf. Trends in travel tech do not yet favor Cambridge's single-purpose devices or Vuzix's AR headsets. Instead, manufacturers are still churning out all-in-one devices, particularly those that blend high-quality image capture with Internet connectivity. New Wi-Fi cameras are helping travelers get their shots online faster than ever. One of them, the 10-megapixel Nikon Coolpix S610c, connects to AT&T Wayport access points at hotels, airports, and fast food joints. From one of these Wi-Fi hot spots, you can upload your pictures to www.mypicturetown.com, Nikon's photo-sharing site. The Coolpix S610c (the "c" denotes wireless capability) also has an e-mail button, so you can quickly send images to friends or your Flickr account. If you like the digital camera you already own, and can't wait to upload snapshots, a device called the Eye-Fi (www.eye.fi) will double as a storage card and Wi-Fi antenna in your camera's SD card slot. The Eye-Fi, at about $100, will also leave you with some extra walking-around money. The Coolpix S610c costs about $250. There are also new mobile phones designed with travelers in mind. Samsung's Saga and Renown "global" phones (as they are known through Verizon Wireless), combine service in up to 200 cities with built-in cameras that represent a bump-up from the 1.3-megapixel variety. The Saga is a Windows Mobile smartphone that features Wi-Fi, along with its GSM/GPRS voice and data services. The phone also has a 2-megapixel camera, a touchscreen, and a keyboard. The Renown is a flip phone with a 2-megapixel camera through which you can access both GSM (Global System for Mobile) and CDMA (code division multiple access) networks. Most big US wireless services offer overseas calling because they have struck deals with international carriers. GSM phone services (the closest thing we have to a global standard) are widespread. But overseas calls, whether you have an international calling plan or not, can quickly add to your travel expenses. Runar Holen, a communications specialist for an international aid organization, has spent years juggling SIM (subscriber identity module) cards and smartphones, and placing calls, planet-wide, from his native Norway to sub-Saharan Africa. The key to avoiding roaming charges "is to have an unlocked phone," Holen said, referring to phones that can accept prepaid SIM cards from local carriers, in places such as Amman, Jordan, or Luanda, Angola. Holen adds that travelers can use their Wi-Fi-enabled smartphones to place calls with Skype at hot spots in and around international hotels and Internet cafes. "A lot of so-called Third World countries have Internet cafes," said Holen, who lives in New York. Meanwhile, developers are cranking out iPhone, BlackBerry, and Windows Mobile applications to help frequent fliers not only find hot spots, but to navigate flight cancellations, and book transportation before they reach the airport. One new digital concierge service is RideCharge, which BlackBerry and iPhone owners can use to book ground transportation in 20 US cities, including Boston. The service pays for your ride automatically by means of the Internet. Another service, WorldMate Live, provides flight status updates, weather, and other travel information to Windows Mobile and BlackBerry devices. Users of iPhone and iPod Touch can also find tip calculators, currency converters, restaurant guides, and Wi-Fi finders at the iTunes App Store. One "translation" application for the iPhone, iCoon (www.icoon-book.com/icoon.html), overcomes most language barriers with cheeky pictograms. Mark Baard can be reached at mark@ baard.com.